Marco Spada was performed at the Paris Opera in 1857, a splendid piece of French Second Empire nonsense, featuring bandits, kidnapped heroines, lovers' misunderstandings, a rejected suitor who in a fit of pique agrees to marry someone he doesn't love and a bandit chief's daughter, freed to marry her lover when it transpires she was adopted. The subject was chosen because it provided two strong female roles for the Paris Opera Ballet's current stars, Carolina Rosati and Amalia Ferraris. Such a complex story was almost impossible to convey in dance. Most memorable was the scene where the whole stage with thirty people, was raised, revealing an underground cavern beneath. After a series of accidents the dancers began carrying charms to ward off evil influences. 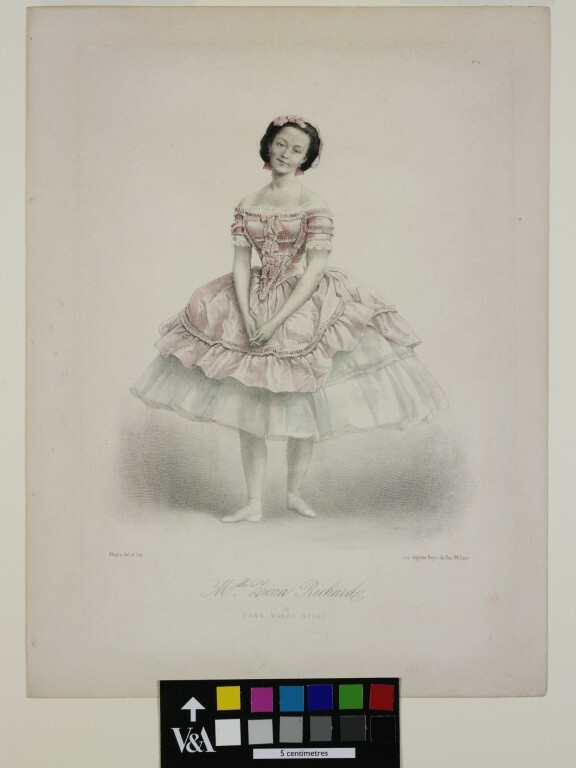 Today, Marco Spada is remembered from prints of minor soloists, including Zina Richard, who were depicted in costumes from the ballet. Her dress follows what has become a conventional dancer's costume, with low-necked, pointed bodice and bell-shaped skirt. The dancer stands, right foot to the front, with her arms down and hands clasped, her head inclined to her left, looking at the viewer. On her hair is a pale pink cap. She wears an off-the-shoulder pale pink dress, with short sleeves and bodice pointed centre front; the bodice and sleeves are trimmed with pleated bands, and down the front with bows. The very full bell-shaped skirt has a white, knee-length underskirt, over which is a shorter pale pink skirt, frilled at the hem, which is caught up on the right side. Zina Richard was born in Russia. She danced at the Paris Opera from 1857 to 1863 and in 1871 joined the teaching staff. The print is No. 4 in the series Les Danseuses de l'Opera, published ca. 1860. There were 14 in total, all the work of Alophe. The print is part of the collection of dance prints amassed by Marie Rambert and her husband, Ashley Dukes in the first half of the 20th century. Eventually numbering over 130 items, it was one of the first and most important specialist collections in private hands. Rambert bought the first print as a wedding present but could not bear to give it away. As the collection grew, it was displayed in the bar of the Mercury Theatre, the headquarters of Ballet Rambert, but in 1968, Rambert gave the collection to the Victoria and Albert Museum. 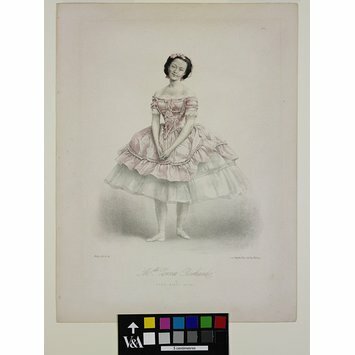 Although it is often referred to as the Rambert-Dukes collection of Romantic Ballet prints, it includes important engravings of 17th and 18th century performers, as well as lithographs from the later 19th century, by which time the great days of the ballet in London and Paris were over. By 1860, photography had become a viable commercial medium, and several of the prints in the series Les Danseuses de l'Opera seem to be copies of photographs. Maybe this was because most photographs were quite small and, of course, sepia toned; translated into lithographs, they could be larger and then hand coloured, making them more suitable for display.